Curious how this came about? Thought so! 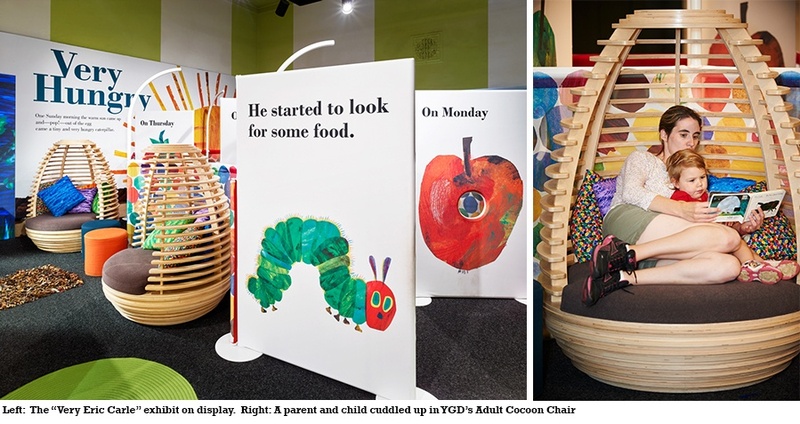 The Pittsburgh Children’s Museum was working on an exhibition titled “Very Eric Carle” which encourages discovery and activities featuring the caterpillar’s journey to become a butterfly. They came across our “play” line, loved our work and wanted us to get involved. Can we create an activity conducive to the classic hit they asked? Of course we can (we’re YGD after all!). As quirky and fun product designers, these are some of our favorite requests. 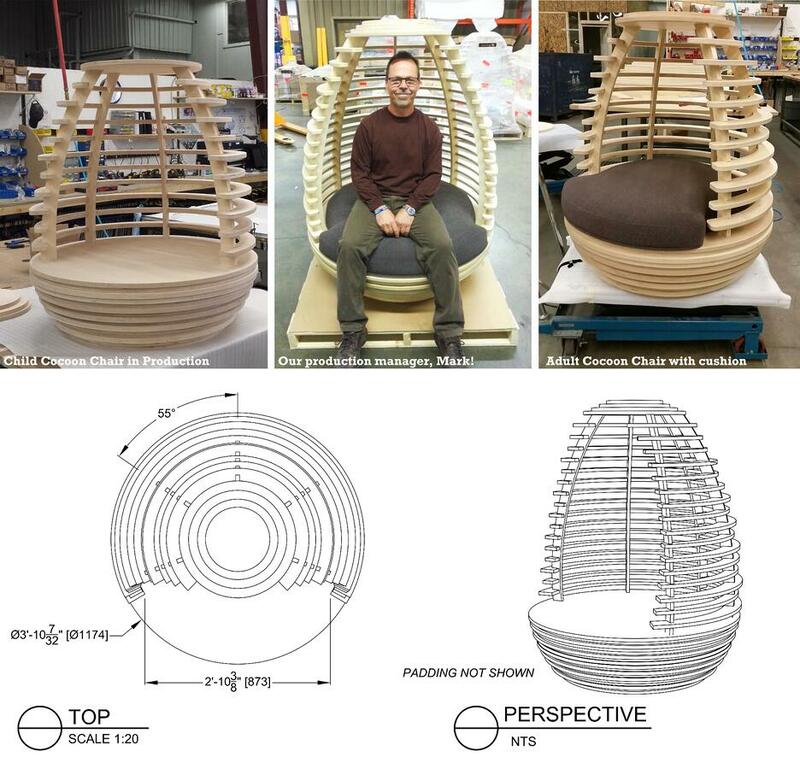 We sketched out some ideas and proposed the Cocoon chair- both a furniture and activity piece where visitors can curl up, read a book and observe the experience around them. 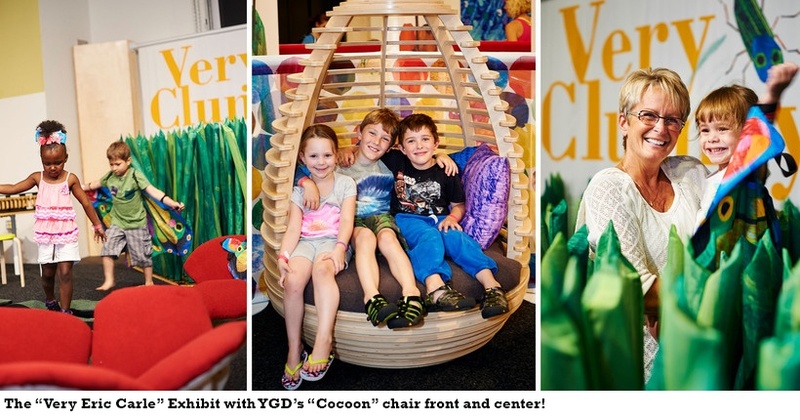 We designed and built two different sizes- an adult chair (33.5” x 21.7” x 52.4” H) and a child chair (23.5” x 15.1” x 36.6” H) using layered CNC-cut plywood, similar to our “play” creatures. Our seamstress created custom cushions upholstered in Interlude fabric with a Crypton finish (color: black pearl). As a traveling exhibition, it was important that these chairs could withstand packing, unpacking and the wear & tear of visitors to the exhibit. Given our strategic material and fabric selections, they are standing up to the test of time. The chairs even had 15 minutes of fame on Pittsburgh’s local news channel, KDKA! Want to check out the exhibit and see our work in person? Click here.